Hundreds of visitors viewed honey bee behavior in LCBA's observation hive, checked out educational displays, & asked our volunteers questions. On the weekend, visitors tasted 14 different varieties of Lewis County honey. Kids played "Bee Buzz ~ Who's Who in the Hive." Scroll down for pictures & details! Thanks to the National Honey Board for donating recipe booklets & educational pamphlets about the making of honey! Above, kids seek the queen in LCBA's observation hive. Above, queen bee "Wanda Sue" & her retinue starred in the observation hive on Tuesday & Wednesday; below, kids of all ages enjoyed bee-watching through the week. Volunteers took bees home each evening & brought new frames in next morning to avoid stressing bees unduly. Above, sample paper wasp & wild honey bee hive hang above LCBA's observation hive as volunteers Alex (left) & Tomme (right) field visitors' questions. Visitors could see how bees build comb in nature . . .
One educational display helped children identify "is it a honey bee ~ or something else," like a wasp, hornet, yellow jacket, or bumble bee? 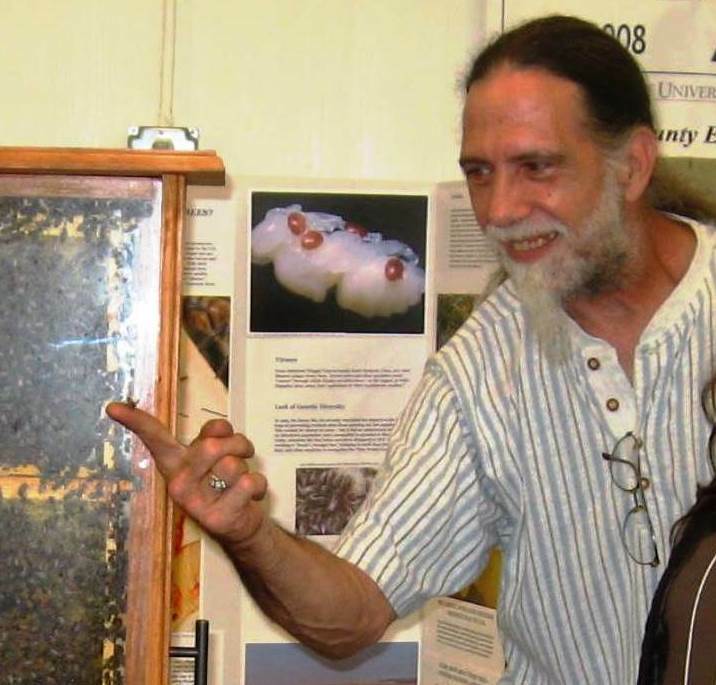 Below, LCBA's busy exhibit: visitors taste honey while, left, President Norm Switzler helps others find queen in observation hive. Below, Membership Coordinator Steve Howard shows visitors how a Langstroth hive works: to learn more about LCBA's mentor program, click here. Below, hive components. At left, a nuc box for transporting a small colony or swarm. Next, the two white boxes are deep hive bodies, designed for long-term bee habitation; the boxes are topped by a telescoping cover for shelter; they sit on a screened bottom board, which provides stability & ventilation. That's a Boardman feeder tucked into the hive entrance, with a bucket feeder right foreground, in front of a division board feeder. At right, the green honey super is topped by a queen excluder, whose bars are spaced to prevent the queen's wider abdomen from getting through: the excluder is normally placed between a deep body & super to prevent a queen from laying eggs in the honey super (you don't want protein in your honey!). Below, some tools of the beekeeping trade: from left, gloves, hat & veil, sugar-spray bottle - an alternative to the smoker, next on the right; front row, a frame puller, bee brush, & hive tool. LCBA's display also featured photos from our Swarm & Colony Removal "Bee Team," whose members rescued over 50 colonies of honey bees from places where they were not wanted in 2013 alone: for more information about our Bee Team, click here. Above, LCBA's display included information on challenges to honey bee health: parasitic Varroa destructor and tracheal mites, the gut fungus Nosema ceranae, habitat loss, lack of genetic diversity, & pesticides, particularly neonicotinoids. Below, the August 13 cover of TIME Magazine asks what is killing honey bees: to read the article, click here; to learn more, visit our Bees in the News page. Below, Kimo's mason bee display: to learn more about these great early season pollinators, visit our Mason Bee page. 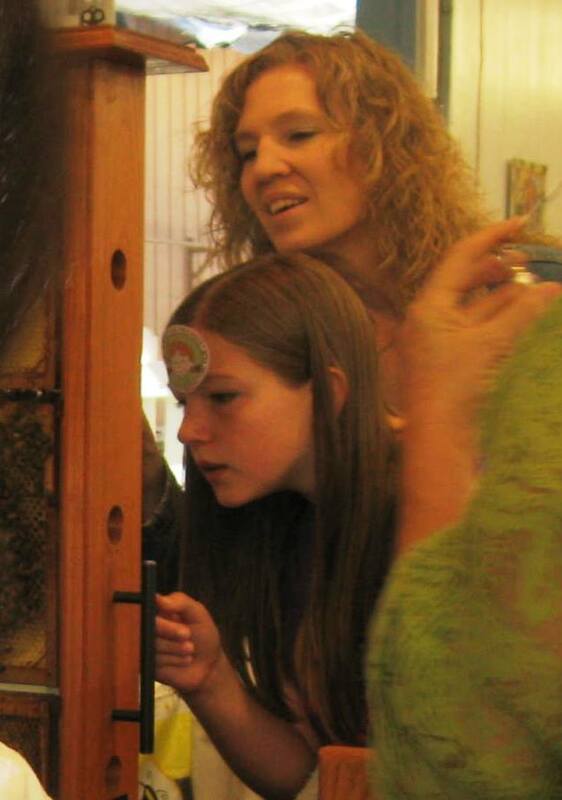 Above, someone seems to enjoy tasting local honey ~ to view photos of our Honey Contests & our children's game, "Bee Buzz ~ Who's Who in the Hive," scroll up & click on the next photo gallery!